When I was eleven years old I was lucky enough to go on a four month world trip with my family. In that time, we spent a fair few hours at airports and lugging suitcases around. We had large cases on tiny, useless wheels that we pulled around with a strap; much like you would pull a dog on a leash. If we were running to make a flight, forget pulling these cases behind us! Also available are complete Train Reaction luggage systems that come in various combinations including small cabin bags, rolling duffle bags, suitcases and bags for golf clubs. All have a built in Train Reaction device for easy attachment. The Train Reaction device is US$14.95. 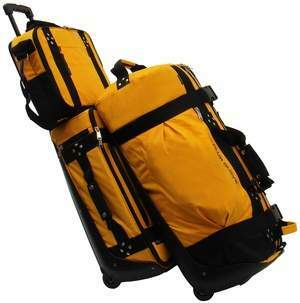 The complete luggage systems are approximately US$700. Although the the Train Reaction website lists Quality Golf as the distributor in Australia, I had no success in confirming availability with them. If you are planning a trip and need a Train Reaction pronto, try Shortgrass in the UK.